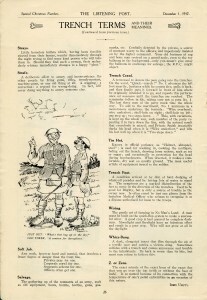 The unique experience of front line soldiers helped to create an exclusive dialect or slang. They used this to speak, sing, or communicate to one another and, sometimes, to differentiate themselves from those who had not undergone the trench experience. Soldiers’ slang drew upon pre-war cultural references, old army terms, bastardized French, and new words created in the trenches. Slang served a variety of purposes. It expressed contempt for one’s superiors or civilians; indicated membership in a particular group; and negated the horrors of the war by trivializing the terrifying. Soldiers say goodbye to wounded comrades leaving a casualty clearing station. 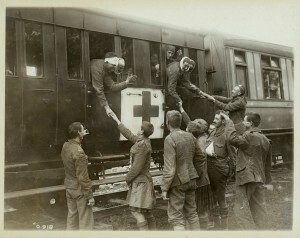 The wounded are on the way to England for further treatment and convalescence. British, Canadian, and other Commonwealth soldiers described England as "Blighty," and also used it to indicate the non-fatal wound that would take you there. "Blighty" was therefore both "homeland" or "country" and, for soldiers in the field, a darkly humorous reference to non-fatal wounds leading to time spent far from the front. The word itself is an Anglicized version of the Hindi for "native land," adopted by British troops in India in the nineteenth century.